Manchester City extended their Premier League lead to eight points with a 3-1 victory at home to Arsenal on Sunday. 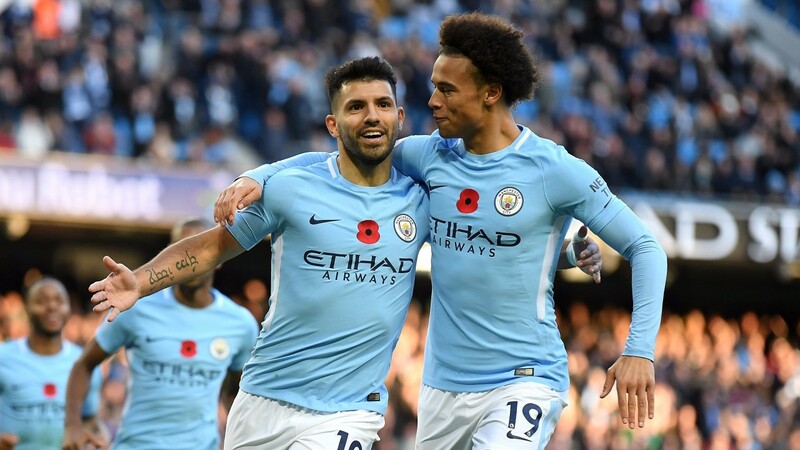 Goals from Kevin De Bruyne, Sergio Aguero (penalty) and Gabriel Jesus were enough to see off the Gunners and they stayed clear when Manchester United lost 1-0 to Chelsea at Stamford Bridge later. The Citizens have dropped just two points this season and are 1-6 with Paddy Power to win the Premier League. Aguero's goal took his league tally to eight, putting him level with Harry Kane at the top of the scoring charts. The Argentinian is 9-2 with bet365 to finish as the league's top marksman while Kane is 6-4. Alvaro Morata is just one goal further back after his 55th-minute header gave Chelsea the points against United. Antonio Conte's fourth-placed side are 20-1 with Paddy Power to retain the title while United are 7-1. Tottenham stayed third after digging out a 1-0 victory over Crystal Palace at Wembley. Heung-Min Son's second-half goal settled a tight contest and condemned Palace to their ninth league defeat of the season. The Eagles are bottom of the table and remain odds-on for relegation. Everton eased their relegation worries by coming back from 2-0 down to beat Watford 3-2 at Goodison Park. An injury-time penalty from Leighton Baines settled the match in favour of the Toffees, who climbed from 19th to 15th. Tom Cleverley missed an even later penalty for Watford, who stay ninth.